Statistics show that about 350 million people speak English as a first language and another 300 million use English as a second language. It is an official or semi-official language in more than 60 countries. English is Second language in the world and used to be everywhere. 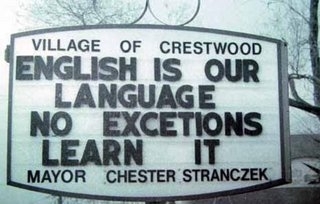 English helps the international community. English is very helpful for business because any business deal can not be possible without English. We can call English is a business communication language. Nowadays, more than 80% of all information in the world’s computer is in English. All kind of information’s in the computer is in English. The world `English ` hardly sounds foreign to us nowadays. Hundreds of words have been affiliated to our language, Bangla. When people use those words, they do not know at all that they are English. Such intimate familiarity of the language with the people has been possible because it was an official language in our country or over a country. It is no more an official language. The demand and necessary of learning this language is increasing day by day. The purpose of using this English can be classified as of home and abroad. English is taught in the educational institutes from the very preliminary stage. The logicality taken in consideration for learning this language is that it becomes essential for the students in the later stage. In the higher level of our education, necessary books written in bangle are not available. Lack of qualified teachers such as scholars, scientists, psychologist, physicians, etc. is one of the vital reasons. Unfortunately, the center of standard translation has not been flourished in our English. Needless to say, English Is a must in case of any research in our country. Now the world is termed as the global village. The language is village speaks is mostly English, which makes even the most ardent advocates of the national, linguistic heritage of other languages recognize the authority of this lingo. English is used in business and commerce, sports and games, across the world. In most of the job ads, English is given special priority. The world is now a global village, and the only way of worldwide communication is through using English.